Sorry in advance for the festival-heavy coverage this week. Send in the cloons etc. Raindance is the UK’s leading independent film festival and although that might sound like a bit of a trial, it has previously premiered The Blair Witch Project, Memento, Oldboy and Capturing the Friedmans. This year the opening film is Humpday and the closing film is The Girlfriend Experience so it’s bound to be a smash. Tickets for individual films, as well as passes for the entire festival, can be bought from the festival website here. You can also read the full festival programme, most of which you won’t have heard of. 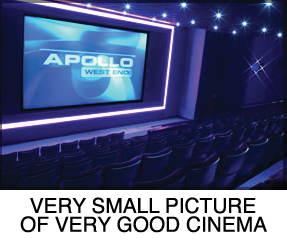 BONUS EXCELLENCE: It’s being held at the Apollo West End on Regent Street which fulfills almost all the requirements of our manifesto. Huzzah!